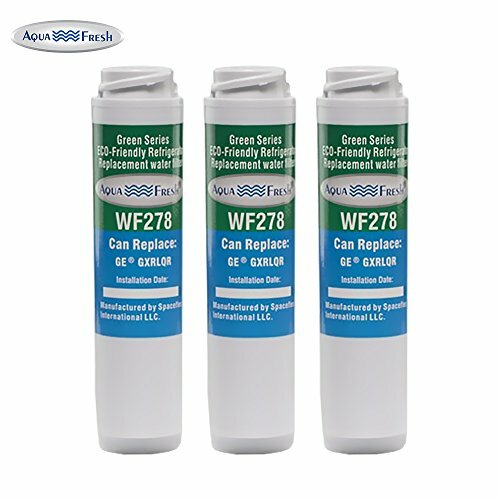 Also Replaces Tier1 RWF1061, IcePure RWF3000A, Water Sentinel WSG-2, Odoga WFEK00011, Denali Pure WF-GSWF, PurePlus PP-RWF3000A filter cartridge. **Please note this is a compatible spare part and the manufacturers' names and part numbers have been used for reference purposes only. 1. Lift the filter away from housing, and then lift again to remove. 2. Align the top of the filter with cartridge holder and push until the cartridge is fully seated. 3. Ensure cartridge is fully seated in the holder, gently rotate the filter until it stops. 4. Run water from the dispenser to clear any particles and remove air from the system. Note: Push the filter firmly into the receiver and turn until the filter is locked in place. DO NOT use any tools to install this filter. FITS: GE GSWF, PTS22SHP, Kenmore 46-9914, AP3418061, GE refrigerator models GTS18KHP, Tier1 RWF1061, ICEPURE RWF3000A, Pureza PF9, WaterSentinel WSG-2, Odoga WFEK00011, Denali Pure WF-GSWF, PUREPLUS PP-RWF3000A (See product description below for complete list of compatible models). If you have any questions about this product by Aqua Fresh, contact us by completing and submitting the form below. If you are looking for a specif part number, please include it with your message.